Jack Baldwin signs a new deal watched by Grant McCann. A loss of playing form has cost Chris Forrester the Posh captaincy. Midfielder Forrester has been replaced by Jack Baldwin, after the central defender signed a new two-year contract which will keep him at the ABAX Stadium until 2019. Baldwin accepted a lower basic wage, but financial bonuses are in place dependent on appearances. Midfielder Jermaine Anderson has so far rejected a similar offer. 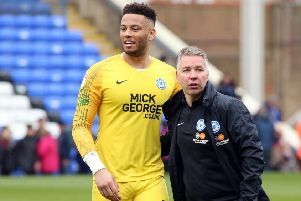 Both players have struggled with injuries during their Posh careers. Posh manager Grant McCann said: “I spoke to Chris (Forrester) and I just want him to concentrate on his game. “I think the captaincy probably got on top of him from Christmas onwards and he would probably agree with that. “I believe Jack has all the attributes to be a really good captain of this club. He is a leader. He is determined and he has a big will to win. “I am obviously delighted Jack signed his new contract. He is integral to the way I want to play and what we want to do next year. “I think he is over the worst of his injuries and you saw in the games he played when he was fully fit that he is a very good player and how much better our results were. Baldwin claims it was a ‘common sense’ decision to accept a different style of contract. He moved to Posh for a reported £500k from Hartlepool in January 2014, but has made 75 appearances for the club scoring twice. He was absent for 12 months after damaging knee ligaments in November, 2014. “My injuries were probably the biggest talking points when it came to the negotiations,” Baldwin revealed. “The chairman said there needed to be common sense on both sides and I believe there has been. “I am thankful to the club for the way they stood by me when I was on the sidelines and it is about repaying that faith now. “I will do everything I can to get my body in the best physical shape possible as I want to have a really good go at next season. It is about getting a bit of a mental as well as physical rest now and then report back for pre-season raring to go. “As for the captaincy, I am not the oldest, but I turned professional when I was 18-years-old and moved away from my family, so I have done a lot of growing up quite quickly. “With a relatively young dressing room, I think it is important to have an older head on young shoulders and I will try and make the environment as good as it can be. “Growing up, playing school and district football, I was made captain so I have a bit of experience in the role and I think people may see me as someone who has the attributes.